Equipped with digital noise reduction features that removes intermittent sounds like barking dogs and passing vehicles. The DNR-18 has an advanced digital CPU which eliminates intermittent interfering noises, like passing vehicles, people talking, and pedestrian footsteps. The traditional band-pass filters filter continuous noises, such as A/C hum, idling motors, and wind. While traditional filters are very useful, they are not able to filter out the common, intermittent noises with broad frequency ranges. 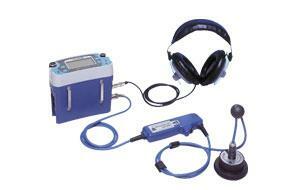 The DNR-18 has optional accessories for water leak "pinpointing" and water leak "surveying". The DNR-18 allows the technician to graph the leak sound levels at 5-10 spots directly over the pipe, after which the built-in amplifier pinpoints the leak's location for you instead of relying upon your hearing - thus reducing the amount of guess work. Brilliant for use in industrial and commercial areas.